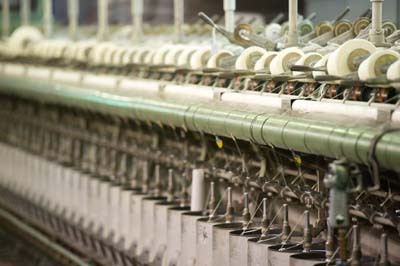 Welcome to Bendigo Woollen Mills – Australia’s largest manufacturer of hand knitting yarn. Our factory is located in the historic gold mining town of Bendigo and we are going to take you through the factory so you can see how we make our yarns. We use Australian Grown wool to make our yarns. It arrives at the factory in large green bales. To ensure we get as smooth and a consistent yarn as possible the tops are all processed through the gilling machine. This machine blends the different tops together according to the specifications we require. The gilling machine is also used to create top dyed yarns. The Aegean Mix, Charcoal, Mineral Mix, Midnight Mix and Silver from the Classic range are all examples of top dyed yarns. For these yarns the tops are dyed before being blended through the gilling machine and then spun. Once the tops have been blended we then turn the tops into singles. We have several rows of machines where the fibre is guided through rollers making it thinner and thinner and adding twist before winding it onto a bobbin. At this stage the singles are starting to look more like the yarn you are used to seeing but it is still very fragile and can easily be broken with bare hands. From here the singles on the smaller bobbins get combined onto a cone. Once all of the singles have been combined onto a cone it’s then time to assemble the singles together and how they are combined is based on the end product yarn we are producing. For example, our 8 Ply Classic yarn is made of a total of 6 singles. Two singles are spun together in one direction and then 3 groups of the singles are twisted together in the other direction. Our 8 Ply Luxury had 3 singles all twisted together in the same direction. The combining of singles is done in a two-step process – the first step is getting the required singles onto the same cone. The second step is putting the twist into the yarn which is done on the Volkman. This leaves the yarn sitting nicely on a cone. 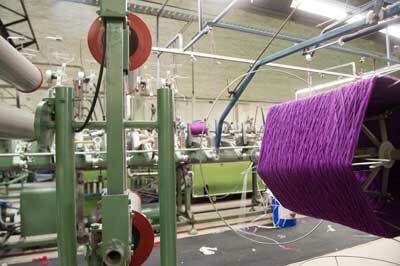 We then want to dye the yarn however to ensure the quality of the finished yarn this is done in hanks. We have a machine that reels the yarn from the cone into a 2kg hank. The yarn is then ready to dye. We have several vats in our dyehouse, they are upright vats and each one can hold a different amount of yarn, the largest takes 288kg. The yarn gets loaded into the vats on large metal sticks which help hold it in place and ensure that the hanks don’t get tangled. The vats are then closed and sealed so they can be filled according the recipe of the shade we are trying to produce. Once the dying process is complete the yarn has transformed into one of the gorgeous shades from our shade card, but the yarn is wet. First, we remove the excess water in a large machine that acts like the spin cycle of your washing machine. Then the yarn goes through the dryer. The dryer has the yarn turning gently in a circle as it dries but the hanks themselves are also being rotated inside the dryer as the yarn turns. The yarn is now much closer to what you will see in our shop or when you open one of our parcels. But we still need to turn it into one of those 200g balls that you know and love. This means putting back on a cone so we can run it down the balling machine. Some yarns will go down the Superba that is attached to the balling machine. The Superba steams the yarn as it is pulled past and into a ball. Some yarns need this to bulk them up a little and make them sit nicely in the ball and feel nicer on the hands when knitting them. The balling machine will add the yarn tickets to the ball and then they are packed into boxes ready for a short drive around the back of the factory to the warehouse. For those of you who have had your order posted out to you, this is where our yarn is stored until it is required to be picked for your order, and then placed in a large crate before being given to Australia Post and making its way out to you.